After covering the deployment of MongoDB in our previous blogpost, we now move on to configuration basics. MongoDB is configured through both the config file (/etc/mongod.conf) and runtime. In the previous blogpost, we mentioned some of the configurables. We will go more in depth on each of them in this post. To understand some of the configurables, we need to clarify the topologies of MongoDB. 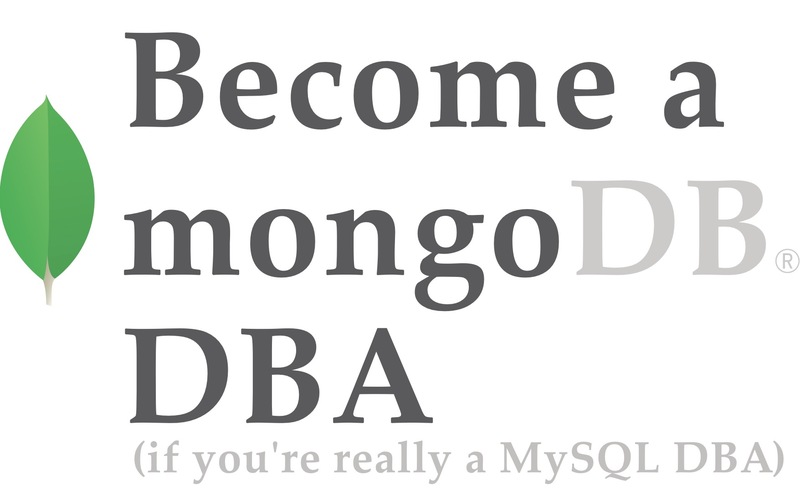 We can simply start with the single standalone MongoDB instance. This is comparable to the MySQL single instance and naturally this topology will not have any data replicated from one host to another. 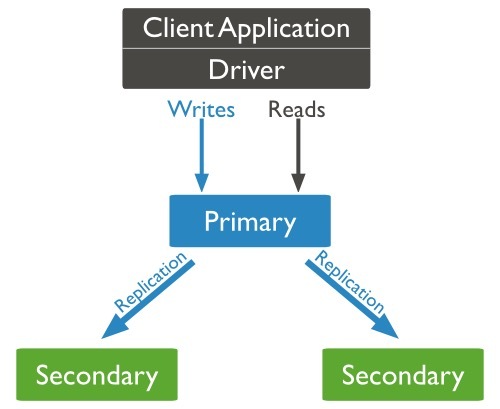 Once we replicate data between nodes, this is called a ReplicaSet in MongoDB. In our previous post we described briefly how the ReplicaSet works, but here is a condensed version: MongoDB will ensure transactions will be written to the oplog (comparable with the MySQL binlog) in more than just the primary (master): also to secondary nodes (slaves). You can configure it to confirm the transaction after either writing to the primary, a set of secondaries, the majority of the secondaries or all members. For a ReplicaSet we need at least two instances to confirm a write, but it is advisable to use at least three. Confirmation can come from secondary nodes or an arbiter. A MongoDB ReplicaSet can best be compared to a hybrid between traditional MySQL replication and Galera synchronous replication. 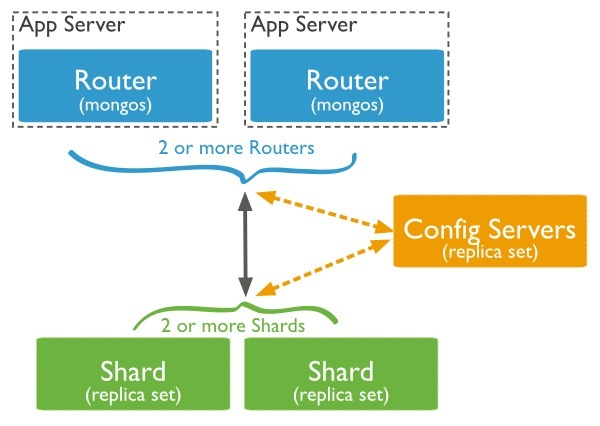 The other topology to mention is MongoDB Sharding. MongoDB will be able to shard based upon the data stored in the Config Servers, and route the queries to the correct shards. In the picture below, the Config Servers and Shards are all independent ReplicaSets. In this blog post, we will skip the configuration of sharding and save that for a future blog post. The most important configuration for the MongoDB ReplicaSet is the name of the ReplicaSet. We have to provide this name in every configuration file of MongoDB to ensure they are all part of the same ReplicaSet. The remaining configuration for the MongoDB ReplicaSet has to be done at runtime. This runtime configuration will be stored in the so-called local database. This local database contains not only the data used for the replication process, but also information about the (other) instances in the ReplicaSet. This is all that is necessary to set up a MongoDB ReplicaSet. Now this host will only confirm writes in the ReplicaSet and not write any data to its own data directory. As we described in the previous post, MongoDB comes with very little security out of the box: for instance, authorization is disabled by default. In other words: anyone has root rights over any database. One of the changes MongoDB applied to mitigate risks was to change its default binding to 127.0.0.1. This prevents it being bound to the external ip address, but naturally this will be reverted by most people who install it. Lately thousands of misconfigured and wide open MongoDB instances have been found, where even one of these instances contained personal information of 93 million Mexican voters. Securing your MongoDB instance is just as vital as securing any other database! We will explain in depth how to enable authorization and SSL. $ mongo -u "myadmin" -p "verysecurepassword" --authenticationDatabase "admin"
You will be able to perform admin tasks only after authenticating against the admin database, e.g., creating new users. So suppose you wish to create new users, you have to provide the authenticationDatabase first and then create the new users. We can explain this simply by comparing it to MySQL. In MySQL, the grantee needs to have the same rights as what it is granting to another user. But in MongoDB, the userAdmin role is only able to administrate users. If you wish to have similar functionality as what you are used to in MySQL, you can additionally grant readWriteAnyDatabase and/or root roles. The latter will open up all admin functionality for this user. You can find more information on the MongoDB built in authentication roles here. Enabling encryption on database communication has become a necessity in the past few years, especially when databases are deployed in the cloud. This accounts for both internal and external traffic. MongoDB supports encryption of both client-server connection and intra-cluster communication. Once you enable Transport Encryption in MongoDB, all of the network traffic of MongoDB will be encrypted using TLS/SSL (Transport Layer Security/Secure Sockets Layer). When enabled, both internal and external communication will be encrypted. There is no possibility to do only one of them. To enable encryption, we need to generate our certificate and private key first. This will force the client to use both a PEM and CA file for establishing the connection. Up until MongoDB 3.2, there used to be an HTTP status page on port 28017, but as of 3.2 this status page has been deprecated. This status page was very useful for gaining insights into what is happening in your MongoDB instance. When exposed to the outside world, it would give a little too much information. However, enabling authorization in MongoDB would enforce anyone to authenticate against the HTTP status page, but Kerberos and the new SCRAM-SHA1 are not supported. So if you choose to install a version prior to 3.2 and not enable authorization: it is recommended to disable the HTTP interface or at least shield it from the outside. Next to the HTTP interface, there is also the simple REST api. It uses the same port number as the HTTP status page, with a REST path built up using the structure /databasename/collectionname?option=value. Naturally the REST api outputs JSON formatted data. This makes it ideal to extract information from MongoDB in web frameworks using this API. However, just as with the HTTP status page, when authorization has been enabled MongoDB requires client authentication, while Kerberos and the new SCRAM-SHA1 are not supported. So it will be better to disable both the HTTP status page and the REST api. If you are in need of a REST api, there are better alternatives around that do support Kerberos and SCRAM-SHA1 authentication. You can find an overview in the MongoDB documentation. We have gone more in depth on the configuration specifics of the MongoDB topologies and security. We hope you have a good insight in how to set up a replica set, SSL and disable the HTTP and REST interface. In the next blog post we will focus more on the monitoring and trending in MongoDB.